Yuta Tabuse, the first Japanese-born basketball player ever to appear in the NBA, has signed with the Link Tochigi Brex of the Japan Basketball League, team president Takashi Yamaya revealed on Sunday. The 27-year-old point guard, who played four games for the Phoenix Suns in the 1994-95 season, agreed to a two-year contract (second year optional), according to a club official. Although the contents of the contract including his salary were not disclosed, Tabuse is expected to be the highest-paid Japanese player in the league. “As we have been promoted to the JBL, he was a player we wanted,” Yamaya told the Shimotsuke Shimbun. The Brex made the top division by winning the second division last season. The team opens the regular season with a two-game series against the Toshiba BraveThunders at Utsunomiya Municipal Gymnasium. The official also explained that the 173-cm Tabuse would be able to accept an offer if an NBA or European team offers him a contract even before his contract with Link Tochigi expires. He would not be allowed to do so for another league team. Tabuse played for Noshiro Technical High School of Akita Prefecture under head coach Mitsuhiko Kato, who took charge of the Brex in April. At the perennial powerhouse, Tabuse won all three major high school titles three years in a row. Tabuse played for Brigham Young University Hawaii, where he spent 3 1/2 years, and joined the Toyota Motors Alvark of the JBL in the 2002-03 season, helping the club capture the league championship title. 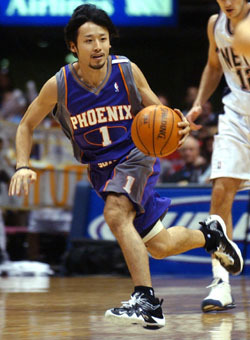 Following the 2003-04 season, in which he signed with the Denver Nuggets but didn’t make the roster, Tabuse joined the Suns and became the first Japanese NBA player. 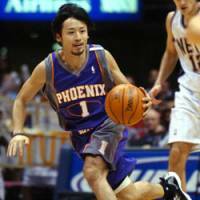 To this date, no one has made it to the NBA from Japan since Tabuse. In the last three seasons, Tabuse mainly played in the NBA Development League (NBDL), trying to crack an NBA roster again, but struggled to gain playing minutes. The Brex is scheduled to have news conferences with Tabuse in Tokyo and Tochigi Prefecture on Tuesday, before joining the team the following day.